I recently read through Plato's Timaeus—particularly the parts where he mentions the destruction of the city of Atlantis, alludes to asteroid strikes and tsunamis, and even discusses the catastrophic destruction of human civilization in recurring cycles. “There have been, and will be again, many destructions of mankind arising out of many causes; the greatest have been brought about by the agencies of fire and water, and other lesser ones by innumerable other causes. There is a story, which even you have preserved, that once upon a time Paethon, the son of Helios, having yoked the steeds in his father's chariot, because he was not able to drive them in the path of his father, burnt up all that was upon the earth, and was himself destroyed by a thunderbolt. This sounds like an asteroid impact—"destroyed by a thunderbolt" and "burnt up all that was upon the Earth." Remember: these are ancient people with no conception of orbital dynamics, asteroids, or even natural disasters (because most natural disasters were thought to have been caused by gods for some explicable reason rather than to have come about by chance). Socrates isn't warning of asteroids here—he's still just relentlessly asking questions (notice the facepalms). Image: Jacques-Louis David, "The Death of Socrates" (1787 painting). How else would they explain an asteroid impact? They didn't even know what asteroids were, and yet here Plato is warning us about these recurring events! In all his wisdom, Plato acknowledges that this myth involving the god Helios and his son actually represents somethings much more sinister. Since the survivors of such an incident would likely not have the knowledge to explain what had happened (like, hey, a big fiery space rock collided with the Earth at extraordinary velocity), they would need to explain it in a way that others could understand—in this case, as mythology involving unseen gods. Alternatively, Plato states that such an event was caused by a 'declination of the bodies moving... around the Earth'. Even the language used here is ambiguous: Plato alludes to other celestial objects moving around the Earth, but he doesn't specifically describe asteroids or their origins. But he does relate that, when such events do occur, they can be catastrophic to human civilization. We know from the fossil record that asteroid impacts and supervolcanoes have had a profound impact on the biosphere of Earth throughout its history (remember the dinosaurs?). Undoubtedly, some of these events have played a role in early human history as well. Between 50,000 an 100,000 years ago, the human population dwindled to as low as around 500 breeding females (in the entire world), and only a few thousand humans in total Bostrom et al. Our species almost went extinct—and if it had, we wouldn't have been around to invent smartphones, or the internet, or even the unicycle. There has been evidence presented to correlate this extreme population decline with a supervolcano that erupted in Indonesia around 75,000 years ago—particles ejected into the atmosphere may have reduced sunlight levels and caused a prolonged 'volcanic winter' that adversely effected plant life (and things that eat plants) on Earth. Here, Plato talks about two very different types of disasters. First is a scenario in which people living in rural inland environments get the worst of it—a supervolcano, asteroid strike, or some other phenomena could cause global temperatures and climate to fluctuate dramatically. In the case of sunlight blockage and temperature decline, long-lasting droughts would occur, crops would begin to fail, grasslands would turn to dust, herd animals would starve, and the people who depend upon farming for sustenance would likely perish. People living inland are described as 'more liable to destruction than those who dwell by rivers or on the seashore'. Most larger human settlements are located either on coastlines or on rivers that are easily navigable to the sea, and in a global volcano or asteroid-induced winter, having access to the resources of the sea—both in the form of trade and fishing—could provide sustenance while arable land is in turmoil. The School of Athens, a symbol of philosophy. Probably wouldn't survive a global cataclysm. Image: Raphael, "The School of Athens" (1511 painting). An anecdotal point here is that nearly every tribal culture on Earth has rituals dedicated to ensuring a 'good harvest' or warding off drought. And that, when a bad harvest does occur, it's often attributed to angry gods—just as other cataclysmic events are/were. Plato also describes the reverse scenario—times when 'the gods purge the earth with a deluge of water' and only the people living inland survive. Large flash floods or tsunamis (caused by Earthquakes or perhaps even a large asteroid impacting in the ocean) could be the culprits here and, since most large settlements are situated in coastal areas, they're more susceptible to be destroyed by a giant wall of water. An important note in this scenario is that those living inland in a rural setting are far more likely to be both illiterate and uneducated—which also makes them far less likely to pass on any cultural or historical information from any civilization that happened to have met its untimely end in some natural disaster. Unfortunately, the survivors of these tsunamis aren't going to be the educated and civilized people who dwell in cities. Those with the best chance of survival are a) hunter-gatherers, as in primitive people still living a pre-historic lifestyle and whom possess little education, and b) rural farmers and people living in isolated environments—in other words, a group of hardy people. 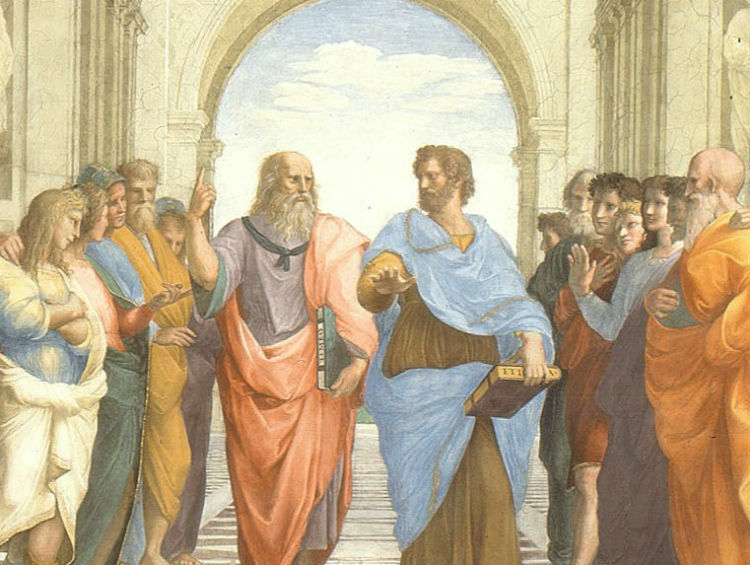 Close-up of Plato and Aristotle, possibly discussing how doomed they are from asteroids and volcanoes. 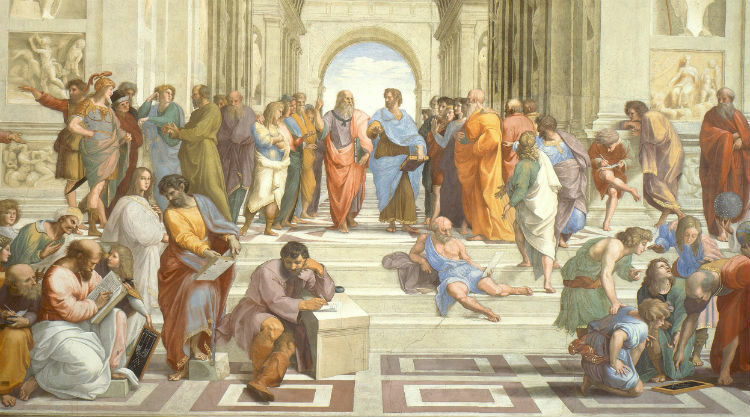 Image: Raphael, "The School of Athens" (1511 painting). These cataclysms are like a reset button. As populations increase, people begin arranging themselves into cities and becoming educated and literate. Just as they begin to gain some knowledge and understanding of the world, disaster strikes, and all of the educated people are wiped out. Civilization has to start all over again—the only people who survive are those who stayed away from the cities, never became literate, and never forgot how to survive through difficult times. We can imagine this scenario if some cataclysm were to strike Earth today in 2017, wiping out some 99% of the human population: which people would be most likely to survive such a disaster? It would probably be the people who are already most detached from modern civilization: uncontacted tribes living in the amazon, or isolated tribes in the jungles and plains of Africa, or herders and farmers who already live in harsh environments (such as the Eurasian steppe in places like Mongolia). Here, Plato ceases with the language of gods and myths, and instead focuses on the naturally occurring phenomena of earthquakes and floods. He abandons the 'angry god' excuse and simply mentions these disasters as a matter of fact: that such events do occasionally occur, and when they do, even the most powerful civilizations on Earth can disappear. This is what death by cataclysm might really look like. 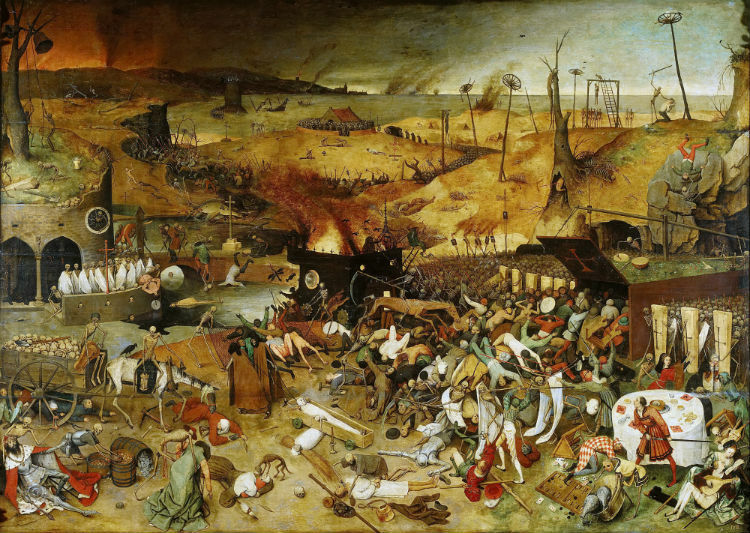 Image: Pieter Bruegel the Elder, "The Triumph of Death" (1562 painting). One fascinating final point here is that Plato specifically mentions the legendary lost city of Atlantis—in fact, he is the original source of the legend (that's right, a philosopher probably made up the most prevailing ancient myth of all time). No evidence for such a city has ever been found, and no accounts of its ever existing have been found prior to Plato. For all we know, he made it up entirely as a plot device for his (unfinished) story. One particularly curious thing, however, is that Plato gives the date for the destruction of Atlantis as 9,000 years prior—which would be around 9,400 BC. This time also roughly correlates to the end of the last ice age, and a period of rapid glacial retreat. Glaciers were melting, and global sea levels were rising rapidly. From 15,000 BC to 5,000 BC, global sea level rose by approximately 100 meters (over 300 feet) before leveling out around current levels. This is interesting because Plato specifically says that "Atlantis... disappeared in the depths of the sea." And rather than the result of a catastrophic asteroid or tsunami, this cataclysm could have been caused by something as seemingly benign as gradual sea level rise due to a change in the global climate. In such a scenario, all coastal settlements (and their potential artifacts) would have been completely washed away by the sea over a period of a few centuries (and even inland areas over a period of millennia). This is interesting stuff, and it warrants further investigation. Unfortunately, these brief passages I've cited are pretty much all Plato ever wrote on the subject. Brief, yet fascinating. But don't just take my word for it; go ask Plato what he was talking about.